Some people would say that I have more gear than sense and they could be right. I've only ever got rid of 2 bass guitars in the past and I've regretted getting rid of both of them. The first was my very first bass guitar, a Grant Violin Bass which I bought on hire purchase when I was about 15. My father had to be the guarantor and it cost £108 including a very nice plush-lined case. I paid for it with my earnings from various part time jobs. I later part-ex'd this bass for something probably very trivial as I can't even remember what it was. I couldn't afford an amp so I used a small cassette recorder as a pre-amp and played through one channel of the family stereo gramophone record player with the LP music coming through the other channel. Technical stuff! Eventually I graduated to a WEM Starfinder Bass Cabinet (1 x 18" speaker) and a Fender Bassman 100 amp. 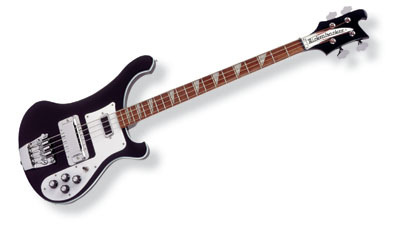 My next guitar was a Rickenbacker 4001 with a Jetglo (black) finish. My parents bought me this for my 18th birthday and it's still going strong. I love Rickenbackers. Black wasn't my colour of choice but it was all that Music Ground in Dunscroft had at that time. I would really have liked a Mapleglo (natural) Rickenbacker although now I would probably pick a Fireglo (sunburst) or Autumnglo finish. My next bass was the other guitar that I got rid of. This one was the rather exquisite Aria Pro II SB1000. I ordered one of these when they were first announced and mine had serial number 000184 if memory serves correctly. This bass was beautifully made and had a full 24 frets and was quite radical looking for it's time. It was an active bass with something like 6 preset sounds selected with a rotary switch, unfortunately I could never really find a sound that I liked. Looking back, I suspect that this was because I was using a Fender Bassman 100 valve amp at the time which was probably not suited to an active bass, I would probably have had more joy with an Acoustic transistor job. You live and learn. An Aria SB1000 similar to the one that I owned for a short time. I later returned this bass to the shop and swapped it for an Aria Pro II LS450 6-string and a Fender Champ practice amp. I still have the 6-string and this is included on the Other Gear page. The story behind my next bass is a bit out of the ordinary. My Rickenbacker 4001 needed some work doing on the frets so I took it into Kitchens Music Shop in Leeds. Kitchens was a great shop, I bought most of my gear from there and became great friends with the staff there, the place is sorely missed. I asked the manager if I could have a bass on loan whilst mine was being worked on. The only thing that he could lend me was an old, battered Fender Telecaster Bass, the one with the big humbucking pickup. It was in that horrible puss-yellow colour and was a bit of a mess really. I didn't really like it but borrowed it anyway as I didn't really have a choice. Well, I really got to like this bass, it was great for Thin Lizzy stuff and the like. I bought it for £185. I've since found out that it's a 1972 model and knowing what I know now, I should have left it as it was - I didn't. I stripped the finish off and added a couple of Di Marzio Jazz Bass pickups and wired it stereo. It sounds really good but I seriously devalued what is now a very collectible bass guitar. I haven't used it in a while and haven't gigged with it for many years but I'm seriously tempted to get it back in the road. This would mean either rewiring it back to mono or running a stereo rig. As I'm gigging with my two Rickenbacker 4001's, which both can be run stereo, this could be the tempting option. A 1972 Fender Telecaster Bass. My Fender Telecaster Bass as it looks now. After the Telecaster Bass, I didn't buy another bass guitar for about 20 years. I did buy some 6-strings as detailed elsewhere. My next bass purchase was a rather nice Fender Jazz Bass. This was a Made in Japan guitar based on a mid-70's Jazz Bass with a rosewood neck and block inlays, a very nice guitar and beautiful to play. 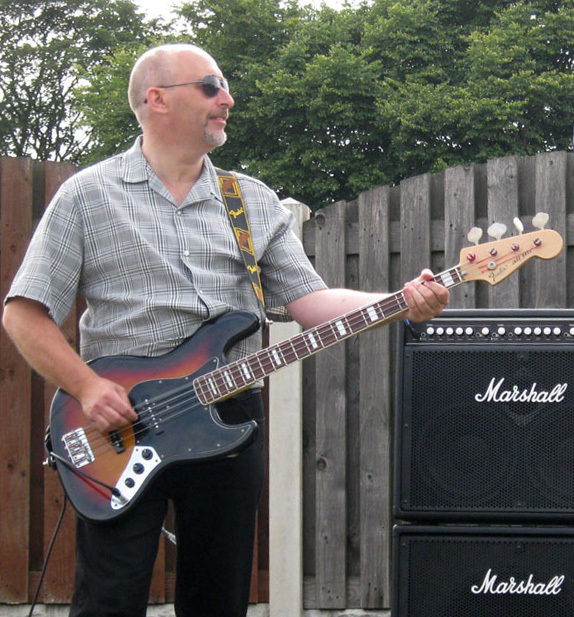 Yours truly with Fender Jazz Bass (this was an open-air gig for a birthday party). The same Fender Jazz Bass but now it has a Badass bridge. Next on the shopping list was that Hofner Violin Bass that I'd wanted so many years ago. 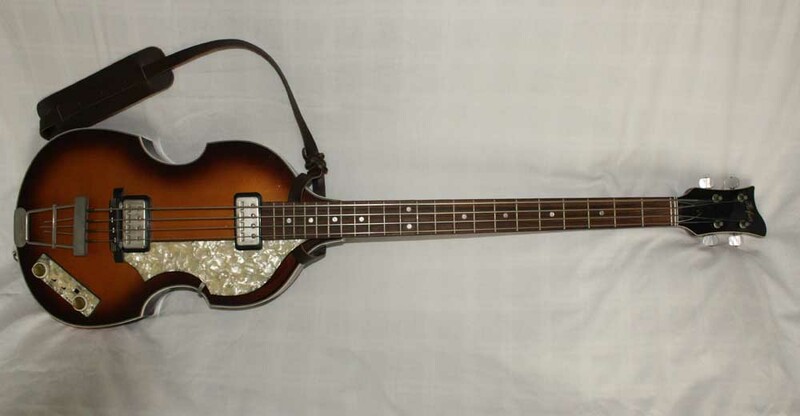 Although known as the Violin Bass for obvious reasons, it is actually the Hofner 500/1. My particular Violin Bass is one of the first Paul McCartney versions and dates from the mid-90's. It's a beautiful little bass but I don't think that I would gig with it as it gives the impression of being very fragile although I'm sure that it isn't having seen so many of them played live. My Hofner 500/1 Violin Bass. When I bought my Rickenbacker, another bass that I tried at the time was a Gibson Thunderbird. It was more expensive than the Rickenbacker but was very nice to play and sounded pretty good. Ultimately, I chose the Rickenbacker but I still fancied a Thunderbird. I'm pretty astonished at Gibson prices and a Thunderbird would cost a lot of money so I settled on an Epiphone Thunderbird Pro IV, this is the active version. A nice bass but needed a bit of setting up. There is some fret buzz so I need to check that the frets are all level and perhaps have them dressed. I did have a problem with the Thunderbird in that I was struggling to get a decent sound out of it, it was very "toppy" with little serious bottom end. I tried everything that I could think of but to no avail and it got to the point where I thought that I would part-exchange it for another bass. As a last resort, I decided to delve into the active electronics to see if they could be bypassed as I figured that this was the root of the problem. When I checked the electronics I found that one of the connecting pins on the circuit board was bent such that it didn't slot into the multi-connector as it was supposed to, I whipped off the connector, straightened the pin, put it all back together and lo-and-behold; a much bassier sound! A nice easy fix but it made me wonder about Epiphone's quality control. My Epiphone Thunderbird Pro IV. As I was so impressed with my Fender Jazz Bass and being a serious Rush fan, it was only a matter of time before I got one of these, a Fender Jazz Bass Geddy Lee. I've always preferred the Jazz Bass with block inlays as opposed to dot inlays so this one goes nicely with my sunburst Jazz Bass. This Geddy Lee model plays like a dream and comes equipped with a Badass bridge as standard. Fender bridges are a bit naff so I've ordered a Badass to go on my sunburst Fender Jazz Bass. My Fender Jazz Bass Geddy Lee. Although I have a few Fender basses, I still love the shape and sound of the Rickenbacker basses. I would really like a 1960's 4001S but they sell for serious money. The alternative is one of the modern "Vintage" versions so guess what? I've part-exchanged my Rickenbacker 330/12 (see Other Gear page) for a Rickenbacker 4001V63. This differs from my Rickenbacker 4001 in numerous ways as it is based on the Rickenbacker 4001S; it has a sculpted and unbound body, dot inlays and toaster/horse-shoe pickups. Despite being second-hand, this one is in absolutely mint condition as is it's case, I don't think it's been played that much if at all but I've altered that and it's now getting some serious playing. Now this next bass was an impulse purchase simply because it was an absolute bargain in my opinion. It's a 1982 Rickenbacker 4001 and although it has the MapleGlo finish, it was originally JetGlo (black) and now has a rather poor satin varnish finish. The truss-rod cover is broken, the knobs are missing their silver tops and the strap button are non-original and are in the wrong place. There is some slight damage to the fingerboard finish in a couple of places as well. Other than that, it plays well and has a nice low action. Since taking this picture, I've cleaned the guitar up, replaced the knobs and the strap buttons and done a few little tidying-up jobs on it. It's already played it's first gig so now I need to decide whether to leave it in a natural finish and apply a gloss varnish or to have it refinished in a different colour altogether. The mighty Moog Taurus 3 Bass Pedals. 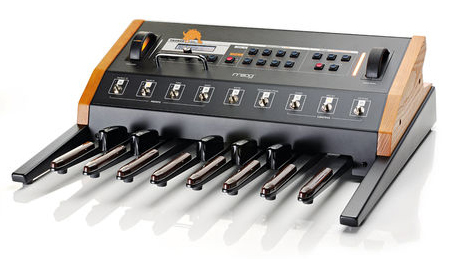 I used to hire a set of the original Moog Taurus Bass Pedals many years ago so when these were announced, I just had to have a set. These pedals are awesome and I hope to be gigging with them before too long. Over the years I have used many bass amps. At one stage I was running my Rickenbacker 4001 stereo through a Fender Bassman 100 amp/Acoustic 2 x 15" cab and a Hiwatt 100 amp/Acoustic 4 x 12" cab with a Marshall JCM800 amp/Fender Dual Showman 2 x 15" cab as a spare! Those have all gone and I'm now using Marshall MB series amps and cabs. I started off with a Marshall MB4210 combo together with a Marshall MBC115 extension cab, that's 450 watts in total. Unfortunately, after only a couple of gigs, the MB4210 combo started cutting out. It was quickly returned to Marshall who found a fault in the amp. A replacement part was to take about 2 weeks. After 5 weeks it hadn't arrived so I gave Marshall some serious grief! To be fair, they have reacted quickly and efficiently and have upgraded my combo to a Marshall MB4410, this is a 4 x 10" combo as opposed to my original 2 x 10" combo. I also have a Marshall MB450H amp head which I'm going to use with the MBC115 extension cab and try a bi-amped set up. Effects-wise, I use a Line 6 Bass Pod XT Live which is a very useful piece of gear. This is the foot pedal version of the Bass Pod XT. The only drawback is that this thing has so many sounds and options, it takes a lot to get the best out of it. I'm still working on getting the best out of it. One of it's features is the option to use a bi-amped output which I am going to try with the Marshalls as mentioned above. I also use an EBS MultiComp compressor pedal and a SansAmp VT Bass Deluxe pedal which emulates the Ampeg SVT amp amongst other things. I'm finding that I can get some very useable sounds out of the SansAmp. A recent addition is an Aphex Bass Exciter which adds a certain "something" to the sound. 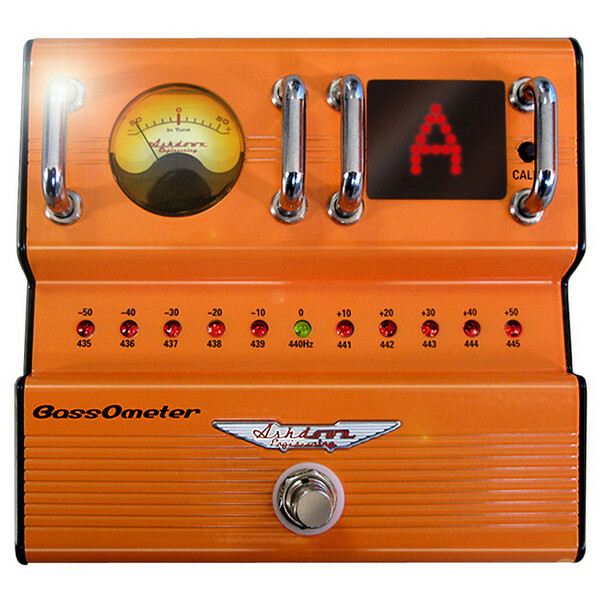 A recent addition is this rather fetching tuner, the Ashdown BassOmeter. It's great for using on dark stages and you certainly know when you're in tune as the central LED becomes a lot brighter, like some sort of death ray. I've just purchased a second-hand Marshall DBS (Dynamic Bass System) 7400 amp head, what a superb piece of kit. This is now my favoured amp and I use it with the Marshall MBC115 cab and the 4x10 speakers of the Marshall MB4210 combo. I'm now in the process of part-exchanging the MB4410 combo for a Marshall VBA400, yep, a full valve top! The combo itself is being replaced with the equivalent Marshall cab, the MBC410. When gigging, I now use a wireless set up and it's amazing how much freedom this kit gives you, no more falling over guitar leads, well not my own at least. It also makes the soundcheck a bit easier as I can wander off stage and have a proper listen.